It was not long ago that I was in a discussion about literacy. The discussion started off with more of a technology twist and then steered towards language arts as we got rolling. The main idea that we were discussing is that all too often teachers view themselves as the experts on the subject and therefore are the only ones who can do the work or activity or perhaps interact with a particular tool. The example that came up was about students editing. Rather than teachers viewing themselves as the only one who can edit pieces of writing, why not teach the kids to be good editors? After all, we want them to grow up to be good editors, right? I was reminded of this as I was going thru some old files on my computer. 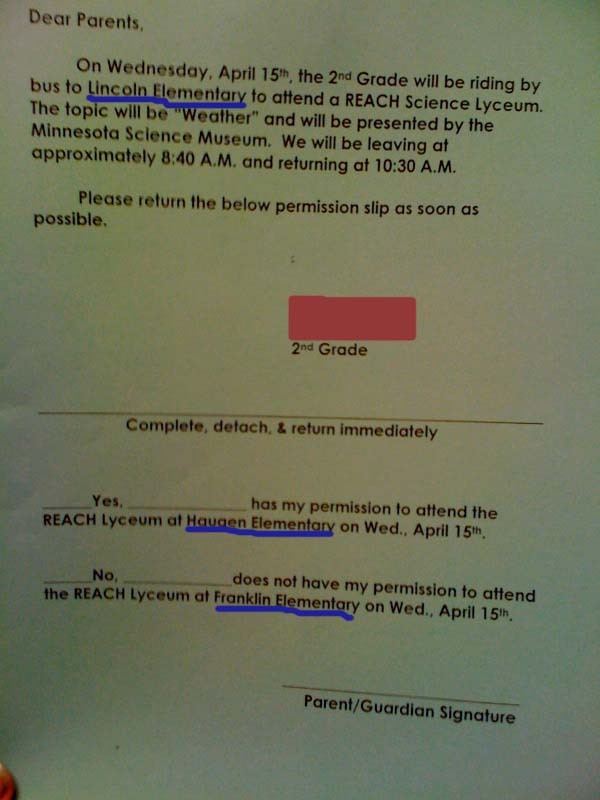 I came across a picture that I took of a field trip slip that my daughter brought home one day. I thought this was a good example of how even the experts can fail to take time for editing, especially when we are in a hurry. If we want our students to be strong academics - then we should be the role models and be sure that we don't send home things like this. If we want our students to be good at going through the writing process, we need to show evidence of having used the writing process ourselves. Literacy training is very important for the future of every person who wants to become a good specialist. I am pleased to have found your site, because the literacy issue is really important.